To mark the 23rd of the month, invoking the 23 hours per day that prisoners spend in their cells in the SHU, activists throughout California are taking action to bring attention to prison conditions. Below, Keramet Reiter, author of 23/7: Pelican Bay Prison and the Rise of Long-Term Solitary Confinement and Assistant Professor, Department of Criminology, Law & Society and School of Law at the University of California Irvine, talks about the prisoner-led movement to end long-term solitary confinement and how those efforts can serve as a model for resistance under the incoming administration. The racist, sexist, anti-immigrant rhetoric of the Trump campaign has left many Americans worried about their civil liberties and civil society more broadly. But the movement against solitary confinement in the United States, and especially the work of the Center for Constitutional rights with the prisoner plaintiffs in the Ashker v. Governor of Californialitigation, should give us hope. It points a way forward through the impending Trump presidency. Over the past five years, the prisoners in isolation at the Pelican Bay supermax in rural, northern California have been able to organize under the harshest, most restrictive prison conditions imaginable. Although each of the prisoners in the 1,056 isolation cells at Pelican Bay was put there for the explicit purpose of minimizing communication and eliminating any possibility of group activity, dozens of them managed to pass notes to each other, coordinate three weeks-long hunger strikes in which thousands of prisoners across California participated, and initiate a class action lawsuit to challenge the harsh conditions of their confinement. As of October of this year, only 5 of the original 517 prisoner members of the Ashker class remain in isolation at Pelican Bay. All 517 prisoners had been in isolation for more than 10 years prior to the hunger strikes, and 512 of those prisoners are now in general population prisons scattered throughout California. For the first time in decades, they are able to feel grass on their feet, shake hands with their loved ones, and participate in school and work programs (read some of their experiences on the CCR blog, here, here, and here). I am inspired every day in thinking of what the Ashker plaintiffs accomplished: joining together, articulating a vision for reform, getting the attention of the press and prison officials, and achieving the reforms they sought. 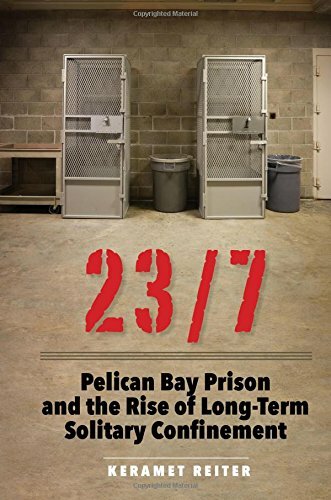 As I detail in my new book, 23/7: Pelican Bay Prison and the Rise of Long-Term Solitary Confinement, the prisoner hunger strikes are especially remarkable in light of the history of Pelican Bay, which was built in direct response to prisoner organizing and designed to prevent any and all coordination among prisoners. When I asked prison officials why they thought a restrictive institution like Pelican Bay was necessary, they pointed to another, more violent era of prisoner organizing in California and throughout U.S. prisons. They pointed in particular to the death of George Jackson in San Quentin State Prison on August 21, 1971. Jackson died from gunshot wounds on the San Quentin prison yard. Prison officials accused him of attempting to escape. But Jackson’s supporters argued he had been set up by prison officials, who objected to his radical, public organizing. Jackson was the author of a bestselling book of letters, Soledad Brother, and had gained worldwide renown for his eloquent critiques of the racial injustice and abusive conditions rampant in U.S. prisons. Two weeks after Jackson died, prisoners at the Attica Correctional Facility in upstate New York organized a revolt. Forty-three prisoners and guards would die: thirty-nine at the hands of National Guard troops who stormed and re-took the prison. Supermax prisons were built to silence exactly this kind of organized resistance. And just as George Jackson would have predicted, these facilities have had a racially disparate and oppressive impact: across the United States, solitary confinement disproportionately affects prisoners of color. It took decades, but the prisoners at Pelican Bay eventually found a way around the isolation of their poured concrete, windowless cells. Their success was built on a multi-faceted strategy: collaborating across allegedly divisive gang affiliations, telling the stories of their experiences in isolation, filing legal complaints, and focusing on basic human rights. These are important lessons for all those living in the United States as we worry about how a rhetoric of hate and exclusion might be institutionalized through executive orders, legislation, and conservative judicial decisions. Stories of lived experience of injustice will be vital organizing tools. And solidarity around fundamental principles of dignity and liberty – even when we disagree with each other about details of implementation – will be absolutely critical. The Pelican Bay prisoners’ success reminds us that, in the face of even the most restrictive conditions, organizing is possible.